Last week was a hard week, it seemed like even mother nature was adding to the craziness. I went through each day, at times being extremely productive, even getting time to read a book or two but come dinner time I was done. I made a nice dinner, set it on the table, called all the kids to eat and then seemed to lose it. I broke my own rule, pulling out my phone as soon as we started eating. Lucas even once called me on it, but I claimed I was just using Find my Friends to see where Daddy was and how soon he would be home; which I did and then proceeded to find anything else to pull me away. Feeling I deserved a break after making that nice dinner. Soon the noise from the table couldn't help but bring back my focus, the kids were all laughing and being silly which was distracting the youngest from eating. So I snapped, yelling to leave him alone and let him eat. By the time dinner was done and Eric finally made it home, I had an angry gray cloud over my head. The fact that it was time to get the kids ready for bed made me want to shut down and do nothing. I did manage to get through, thanks to Eric saving the day, leaving his dinner uneaten until he helped get the kids to bed. While he finished reading a story to Lucas and Alex, I came downstairs to peace and quiet and then the guilt hit me. The fact that I know this time is so short and precious, especially with my oldest two who are gone at school all day and yet I still can't find the ability to really be there just those few hours with them. Sure I help them with homework, sure I make them a nice dinner but I am not there. I certainly am not living up to my word of the year and being aware of what is going on around me. I am shutting down. Why, why am I doing this I questioned? In some ways it had been quite a productive week, organizing my kitchen one area at a time, keeping up with the laundry, making dinner every night. I should feel like a rock star and amazingly productive. So why? Why was I sitting there feeling guilt and remorse? Then it hit me, it was because I was being selfish. The more time I took for myself, the more I thought I deserved time. 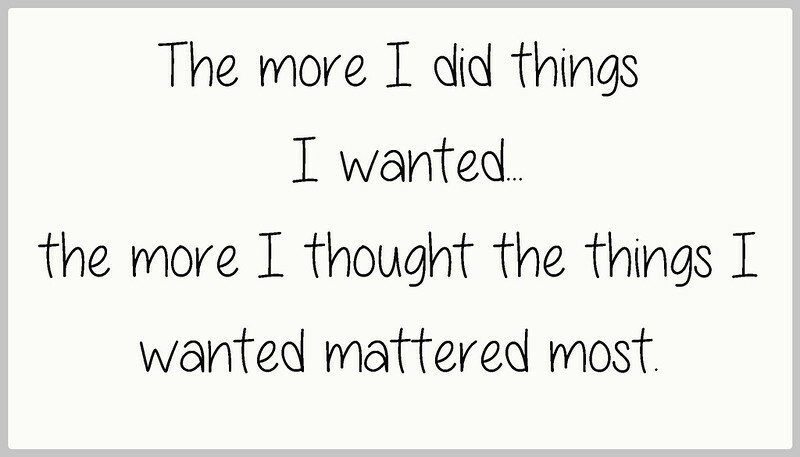 The more I did things that I wanted, the more I thought the things I wanted mattered most. The more I got caught up in myself, the less I was able to see others and the more miserable I became. I am not saying I don't deserve time for myself, as I do, I am a person too; but I don't deserve all of the time or even most of the time. At this stage in life, heck in any stage of life, it is only the times when I am aware, when I think of others, when I reach out to help and be there- those are the time I feel the most happy, the most satisfied and content. The funny thing is that when I do put others first, taking care of others, of the things I need to do, then the more time I seem to have for myself in the end. 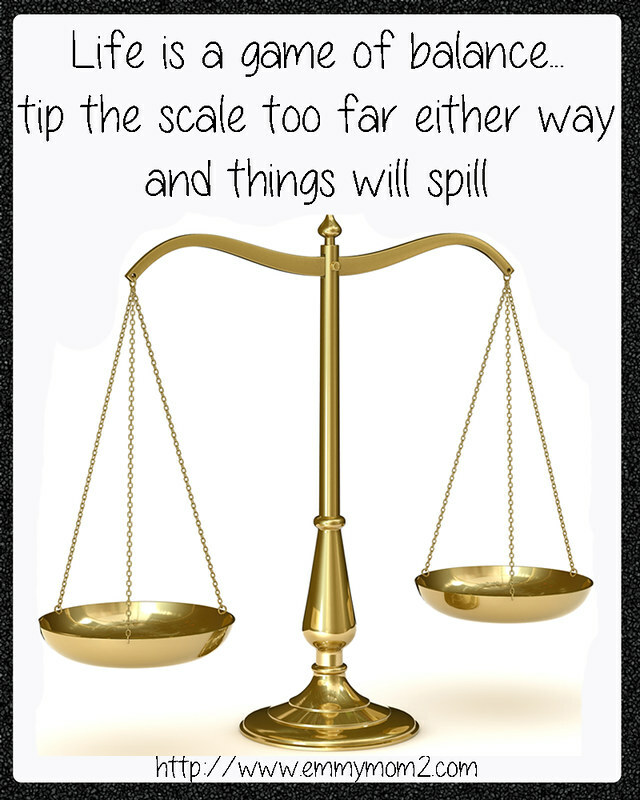 Life is a game of balance, if the scale tips anyway too far, things will spill. If I spend all my time giving, I will be neglected. If I spend all my time on me, life will turn to pieces. So this week, I started over, started by putting my phone on the counter during dinner where I wouldn't be tempted to grab it, started by getting some quick chores done in the morning then really playing with my youngest for a while. I tried to stop thinking about what I want and focused on being aware again. Aware of what matters most. What do you do to keep balance in your life, to help you remember the big picture? Todd and I were talking about this exact thing just the other day. We agreed that it seems like the times we get most frustrated with our kids is when we are trying to do something for ourselves in a situation when they are around and we should be focusing on them. It's always when we are trying to read something, or watch something when we feel just like mentioned. It's good to remember we aren't alone in feeling this way, and that the best remedy is forgetting yourself! Thanks for the great post! Yuck, what a hard lesson to learn! But I am glad you figured it out so quickly. It is true, the more we serve, the happier we are. Thanks so much for the reminder. This is a great companion piece to the one I posted earlier this week. I think I have been acting selfishly, and I see that I have let life get out of balance. Taking care of a houseful of sickies this week has helped me readjust back a bit. Thanks for this. This one is always tough for me. It always seems that there is so much to do even when I'm doing the things I want to do. So glad I'm not alone. My week felt a lot like yours. I got so much done around the house but I lacked patience with my son. I never seem to manage to have all things in balance all the time. Such a great post and I echo what Rachel said. The times I seem to get frustrated the most are when I'm trying to get something done and the kids are being loud, asking for things, etc. The thing I'm trying to get done usually isn't that important and can and should wait. I also notice that the more one on one quality time my kids get, even if it's just an extra 10 minutes a day of completely focused one on one time the less tantrums/fighting/etc. I see. I need to be better at both of those things. Thanks for sharing. Yes! That is why I started Time for Tots day several years ago, as just spending even that 1 hours really focused and with tons of fun things made the whole day so much better.. I really need to do that with Ryder again. What a great reminder! I get so sick of me sometimes. I get this! At night when I'm going to bed, I always wonder why I didn't spend just a little bit more time with Lex doing something other than her HW or watching TV. I'm trying to get better, too! It's so hard to find the balance. I know I need to take care of my family and myself. Sometimes one has to come ahead of the other. I can relate to this! One of the things I do is I try not to have my phone at the table when we eat. I just bought a book last weekend,"Hands Free Mama" that I'm looking forward to reading. I know that I ignore my kids too often because of a device in my hand or because I'm sitting at the computer, busy with my own things. I love your honesty. I have had very similar experiences and you are so right. Finding balance is key. Recognizing that things are off and striving to fix them is the key to balance. I hope this week is better. I know I struggle to keep those dark clouds away sometimes too. My mom was talking to me about this post. I try to make sure phones (all) are not at the dinner table. It's the one time we are gathered together and talking and laughing. It's a good time. That is awesome and so good you do that. Family dinner really is such a huge important thing. That is true, I think the Savior was always serving and giving and really that definitely brings the most happiness.